Stimulates the disappearance of staining and stains of vascular origin. 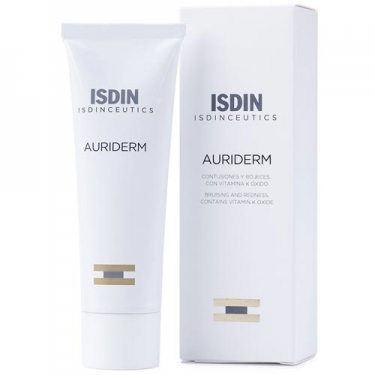 DESCRIPTION: Auriderm from Isdinceutics is a localized action cream that helps to reduce bruising and redness after dermatological or aesthetic treatments, such as laser, mesotherapy, hyaluronic acid or surgical intervention. It avoids deposits of post-inflammatory and post-surgical pigmentation, also accelerating the process of disappearance of staining and stains of vascular origin. Its patented formula of Vitamin K oxide, vitamin C and E make it activate a brokerage, depigmenting, anti-inflammatory and anti-redness action. The skin thus transmits greater softness, attenuating imperfections. Apply preferably 10 to 15 days before and after aesthetic treatments.